This review of Purple Powerbase explains all its features and why is it a good investment for your bedroom. Before you jump on to the review, here is a demo of Purple powerbase right from the Purple headquarters in Utah. The Purple Power Base is all that you have dreamt of in life and seen in movies featuring technology from the future. Well, luckily, you are in the future and the Purple Power Base is pretty much existent. A bed, with adjustable positions and frequency resonant massage feature is all you need in your bedroom for a good slumber. With Zero Gravity stimulated weightlessness and its customizability, it is the most technologically advanced adjustable bed available in the market. The amazing Purple Power base not only improves your sleep quality, but helps you wake up more refreshed than ever. Allowing you to watch TV, work on your laptop, or read a book, it adjusts itself to the required support, improving your overall posture. What’s more? You don’t need to sit close to a socket anymore, as this has all the USB ports and outlets that you’ll be needing while you work or relax. If your partner doesn’t admit snoring during the night and won’t take the medical treatment for that, its time you say goodbye to another worry. Purple powerbase comes with anti snore technology. It elevates the head position slightly that brings a halt to the night long snoring by opening up nasal airways. This resets the breathing pattern altogether, thus stopping the snoring by simply pressing a button. Its a win-win. You get to sleep undisturbed and your partner stays safe from those elbow attacks and fake coughs. We’re all grateful to Isaac Newton for having discovered gravity but sometimes, it is not as beneficial as it appears to be, considering how our bodies function. Without gravity, we’d all be floating in the air, but isn’t that what we feel like doing at times? 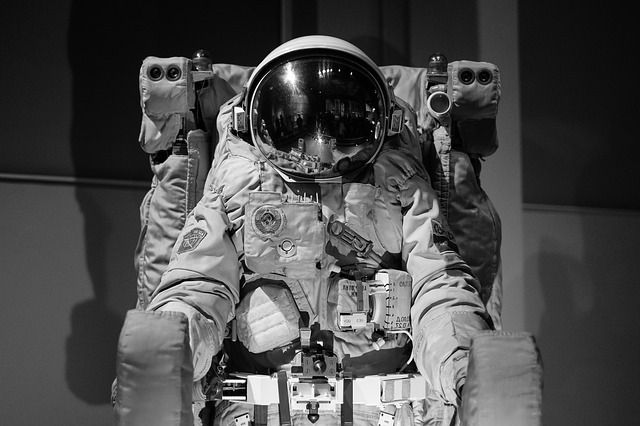 Zero Gravity Feature works on simulating weightlessness. It prevents your mattress from pressing on the existing tender pressure points of our body, including back, feet, neck and shoulders. Moreover, it reduces the pressure exerted on the heart, drastically improving blood circulation. Zero Gravity feature is ideal for all sleepers alike. Individuals with lower back and joints pain experience significant improvements after shifting to adjustable bed bases like Purple Power base. Literally making you feel like sleeping on a cloud, this feature is better experienced than explained. No longer are beds confined to night time only, it is now possible to enjoy everything from the comfort of your bed, thanks to the Purple Power base. You need not worry about the perfect reading position, or watch TV in a comfortable position or work on your laptop without affecting your posture adversely. Every section of this power base is adjustable, making it extremely customizable. While the remote control has a standard set of positions for you to choose from, you can further customize them to find the perfect sitting/sleeping position for yourself. You might be underestimating the massaging capacity of the Purple Power base considering it is an adjustable bed only, technically. Again, this is one of the features that is better experienced than described. However we try our best to give you an idea close to reality. The base operates on frequency resonance technology. This works on the concept of vibrating in synchronization with the body’s natural frequencies, thus soothing your tired muscles and relieving pressure off your joints and pressure points. The sleepers can enjoy massage through the night. The best part is that the whole base doesn’t vibrate so if your partner is not a huge massage fan, there’s nothing to worry about. The various patterns and intensities can be accessed through the one-touch button remote. Although there is a pre-determined set of positions, you can always customize the settings. Not all of the features are confined to the remote. Some of the features of the Purple Power base call for the app installation. The app lets you set alarm timings which can wake you up through its quiet yet powerful vibration that gains intensity gradually. Another reason why you would need to install the app is to set and save your customized sleeping positions or massage settings to save you from the effort of customizing them to your need every time. Wouldn’t we curse technology, if we had to get up and move for every tiny little function in this bed? ( Couch Potato Alert) Nothing would seem as relaxing as it does with a remote operated functioning. You can access everything with its wireless, one-touch remote system that also comes with a charging spot for your laptops, mobile phones and tablets. The Anti Snore button on the remote elevates the base from the head position without you having to manually adjust it. Similarly you can choose from a pre-programmed set of positions or set it manually as per your requirement. If you’re longing for your traditional bed, you can always return to the normal position by the Flat button on the remote. The frequency resonant massage can also be accessed through this remote. The remote operates on battery and comes with a set of AAA batteries for first time use. Since the Purple Power base is the epitome of comfort, it would be pretty unfair to get up for charging your phones and laptops if there’s no charging slot near your bedside. The creators definitely did a good job analyzing what could one possibly need to access from the comfort of their bed. This is why this base comes with two A/C outlets and one USB port. These charging spots are located on the remote stand that comes with the bed base and performs a dual function. Firstly, as the name suggests, it acts as a support for your remote. Secondly, it comprises of the charging slots we’ve been talking about. Two A/C outlets are present at the back of the stand and one USB port at the front. This makes it a mobile power bank, that makes charging your devices hassle-free. Is your bedroom light too bright to stay switched on through the night? The purple Power base comes with a brilliant Under the bed lighting feature that has multiple uses. It can be used as a night light, not too bright and not too dim. In fact, among other commercially available alternatives, Purple Power base has the dimmest lighting, perfect for night time. You’d want to switch this light on to look under the bed if and when you drop something. Another probable use is to determine your surroundings when you have to get out of bed in the middle of the night. This option can be accessed through a lightbulb button on the remote control. The light intensity is not-adjustable and is pre-determined. The Purple Power base is an adjustable bed base providing you the comfort of a recliner and a bed combined, with everything just a move way. The bed base is generally operated through a wireless remote control but some of its features can only be accessed through the app (Alarm and custom positions). The remote control works on a one-touch button setting. It controls the lighting, massage feature and pre-set positions that can be manually changed through easily comprehendible signs on the remote control. 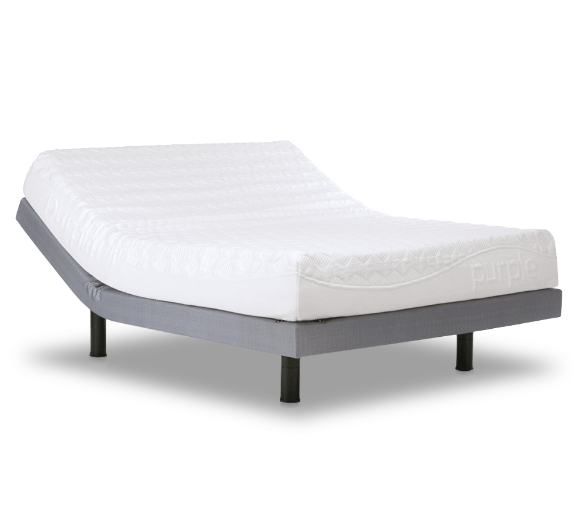 The flat button restores the bed base to its normal position. The app lets you set alarms and save your customized positions for future. This saves time and effort in finally deciding upon a position that fully satisfies you. The alarm works on a vibration only basis, gently gaining intensity. It works on the zero gravity function-alleviating pressure from pressure points, while you enjoy sleeping on a cloud. The frequency resonance motion works on the principle of improving blood flow by resonating our body’s frequencies, providing relief. Since the Purple mattress syncs with the base’s functioning, no other mattress is not designed to the customized features as its own specific mattress. Since our usual postures involve sitting, standing or lying down straight in our daily routine. Sitting or standing for prolonged periods of time can adversely affect your blood circulation. If your job requires sitting or standing for longer durations, you need to find a way to improve your blood circulation. As many of us have learnt in elementary school biology, to improve blood circulation the feet need to be elevated above the heart. While this can be a difficult task while you’re conscious, the feet position in the Purple Powerbase can be elevated and adjusted through its button, improving blood circulation, reducing swelling among its other benefits for blood pressure and diabetes patients. Since the primary purpose of changing your bedding is to improve your sleep quality, its no use investing in a replacement, if that state isn’t going to change significantly with the replacement. Other than adapting to all postures of your daily routine, the Purple Power base lets you sleep better with its customizability. By filling up gaps other mattresses can’t reach, it alleviates pressure from your pressure points. Suitable for all sleepers alike, this mattress provides support to your curved mattress that other beds/mattresses fail to do. By relieving back pain, breathing problems, digestion troubles, through the adjustable base, these beds notably improve your overall health. By providing you the comfort you desire, your REM sleep is increase, which is the most significant part of your sleep cycle. Enough of the analysis. Let’s talk practically now. Yes, the Purple Power hosts a set of amazing features, you did not know you wanted, until you read about them. But then there’s a premium price pay you pay to get access to all those features, which bring us down to the question, is it worth the price tag attached to it? While the Purple Power base is great for some, the experience may vary across users. Some users believe that its a little too firm while others have experienced an improvement in backaches and joint pain. Generally recommended for people who wake up with backaches, users believe that this bed base is not suitable for side and back sleepers which make majority of the population. Secondly, the company mattress is considerably thinner than other standard mattresses. This has an adverse affect on the overall comfort level associated with the mattress. If you’re looking for a bouncy mattress and bed, this should definitely not be your choice. Spring mattresses offer way too mcuh bounce than the Purple Power base mattress and bed does. Heat retention has been another issue associated with the mattress, so you would like to consider your options first if you don’t sleep hot. The alarm and massage features are definitely more of a luxury than a necessity. Chances are that you already own a recliner with massage features, why make an additional purchase? However, some of the features are irresistible and one of their kind. This includes the anti-snore feature, customized positions setting and the zero gravity, that improves overall sleep quality and is highly recommended for people with insomnia, diabetes and blood pressure related ailments. Yes you’ll hate the Purple Power base because the comfort it provides won’t let you get out of bed in the morning and you’ll miss it all day while you’re away. Whether it should make it to your buying list or not entirely depends on how you weigh each requirement. Since every customer is different from the other, the needs may vary too, ultimately affecting the buying decision. Purple Power base is a revolution in bedroom furniture, definitely acing the comfort game, taking it to a whole new level.